robust method for analyzing RNA. It has been used to corroborate the findings of other genetic methods, such as microarray and RNAse protection assays, and has become the gold standard for quantifying changes in gene expression. Stellaris FISH is a new RNA detection method that provides direct quantification of transcripts in situ, with potential to become the standard for mRNA and lncRNA interrogation using microscopy. 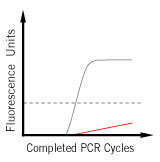 In qPCR, fluorescent modified oligos may be either linear or non-linear in structure. In either conformation, Förster resonance energy transfer (FRET) combined with the static quenching mechanism inhibits reporter dye emission until hybridization with the target (Read Quenching Mechanisms in Probes to learn more about FRET and static quenching). Upon hybridization the quencher and reporter dye are separated spatially, interrupting the quenching mechanisms and permitting fluorescence emission from the reporter dye. 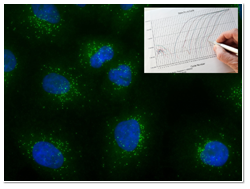 The increase in signal intensity with repeated PCR cycles indicates the accumulation of product and allows for accurate quantification of template. Gene expression analysis by qPCR is dependent upon direct comparisons between the normalized fluorescence emission of individual samples against a standard curve or through ‘relative’ comparison against expression of an internal calibrator gene. How do I know how bright the dye will be? The mathematical model of PCR is based on the assumption that each DNA template molecule is reliably duplicated once per cycle, assuming an excess of reagents. In practice, a variety of factors impact amplification kinetics, particularly when the copy number is low, causing deviation from the ideal model. These factors include RNA quality, residual inhibitors, operator technique, primer quality, and efficiency of reverse transcription, to name a few. In addition to those readily identified factors there is also the unavoidable 'Monte Carlo' effect. Fluorescent probes are used in biochemical assays to monitor specific events such as binding, cleavage or conformational changes. 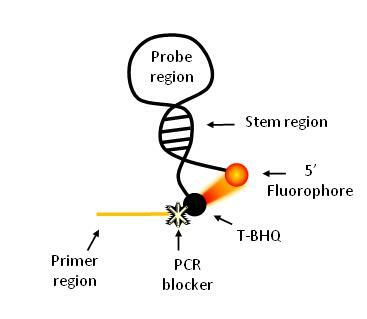 Dual-labeled probes with a fluorophore and a quencher have many applications in genetic analysis. The efficiency of fluorescence quenching is very distance dependent – if the reporter fluorophore and quencher are far apart, there is fluorescence; if the reporter and quencher are close together in space, fluorescence is suppressed. Typically, the reporter and quencher are placed at specific sites in an oligonucleotide such that a change in their distance will produce a maximal change in fluorescence and effectively signal the event being monitored (often hybridization or nuclease activity). The oligonucleotide acts as a flexible tether linking the fluorescent reporter and quencher. Below, we present fluorescence quenching mechanisms for dual-labeled oligonucleotides in genetic analysis. Quantitative real-time PCR (qPCR) was developed as a means to detect the presence of target nucleic acids and is routinely used to quantify gene expression through reverse transcription of RNA transcripts. The detection method depends on a signaling molecule, often a dual-labeled oligonucleotide with a fluorophore (reporter) dye at the 5’ end and quencher dye at the 3’ end. The development of new reporter dyes, true dark quenchers and advancements in probe sophistication enable researchers to improve their genetic analysis. One significant improvement is in the application of multiplexed qPCR to yield additional data and confidence in the results. Quantitative real-time PCR (qPCR) is based upon the fractional cycle number at which a replicating sample of target DNA accumulates sufficient fluorescence to cross an arbitrary threshold. 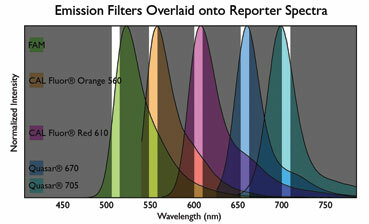 The threshold is either manually selected or auto-selected to fall several standard deviations above baseline fluorescence and below the plateau phase, where the amplification begins to attenuate. Typically, the threshold is adjusted to the mid-point of the exponential phase of the PCR, at a location suitable for all samples in the experiment. The CT (cycles to threshold) value for a given reaction is defined as the cycle number at which the fluorescence emission intersects the fixed threshold. Quantitative real-time RT-PCR was developed as a means of quantifying gene expression either relatively or absolutely, with accurate and reproducible results. Despite advances in dye chemistries, variability continues to haunt research scientists. One effort to reduce the observed variability between technical replicates was to include the ROX dye (5- or 6-carboxy-X-rhodamine) as a passive reference in the PCR master mix. When the polymerase chain reaction (PCR) was first described, the Klenow fragment derived from the Escherichia coli DNA Polymerase I was the paramount enzyme for sequence extension. Due to its lack of stability at high temperature, it needs be replenished before each cycle. Upon the discovery of thermophilic bacteria which thrive at temperatures greater than 45 °C, heat-stable polymerases which function at higher temperatures were investigated in an effort to eliminate the need to replenish enzyme following each denaturation cycle. Research trends in laboratories today increasingly steer towards gene expression analysis and genetic testing, often in the form of qPCR. As reproducibility is essential to genetic research it is imperative that scientists know the fundamentals of micro-volume pipetting. Forward and Reverse Pipetting: This discussion is limited to the use of manual pipettors. 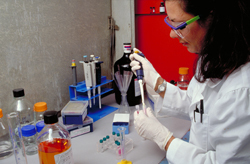 Electronic pipettors are capable of other pipetting techniques such as dispensing, sequential dispensing and diluting which are not discussed here.